Connections with the JR Yamanote Line and the Keihin Tohoku Line are available through JR Hamamatsucho Station and connections with the Toei Oedo Line and the Toei Asakusa Line are available through Daimon Station. In addition, Takeshiba Pier, which sends ships to the Izu and Ogasawara Islands, and Hinode Pier, which serves as a port for water taxis touring Tokyo Bay and the Sumida River are near the station. A landmark on the western side of the station Zojo-ji Temple sits behind Shiba Park. 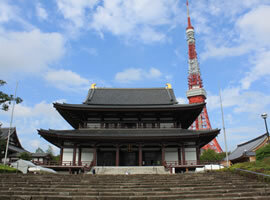 The temple was founded during the Muromachi Period (1333-1573), and the area between it and the station is thriving. There are also many places to see in Shiba Park, one of the biggest parks in the city, including the Maruyama burial mound. Soaring just beyond is the symbol of the city, Tokyo Tower. Its crown as the tallest building in Japan has been taken by the Tokyo Sky Tree, but its illuminated, gravity-defying frame is a magical sight to behold. Right along the east side of the station is the Kyu Shiba Rikyu Garden. 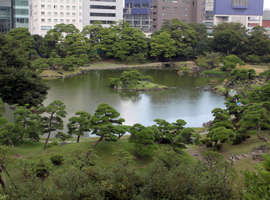 The private garden of a clan leader in the early Edo period, it is dominated by a central pond and serves as an excellent example of a touring water garden. North of this are the Hamarikyu Gardens. It is a model of Edo-period gardens for visiting daimyos. A tea house where one can enjoy a cup of green tea floats on its tidal pond. Marvel at the contrast between the ancient gardens and the modern skyscraper district.